After “Pomp and Circumstance” ends, most college graduates have about six months to get their financial lives settled before they start repaying student loans. Instead of taking this time to research their options, though, they blithely settle for whatever the loan servicer offers, even though it places a financial burden on them. Standard Repayment Plan: This is the repayment plan that will be “assigned” to you if you make no alternate choice. Payments are set at a fixed amount, and you usually pay this amount for up to 10 years — or up to 30 years for Consolidation Loans. If you feel that you can afford this amount, this is usually the best approach as you know how much you will pay for how long. The total amount of principal and interest you will repay is usually less than other options. Graduated Repayment Plan: If your estimated income is lower at first, but you expect it will increase over time, this might be a better option. Here your payments will be lower initially and then increase, usually every two years. Similar to the standard repayment plan, you will usually pay this amount for up to 10 years or up to 30 years for Consolidation Loans. Because your initial payments are lower, more interest accrues, so the total amount you repay over time will be higher than the standard plan. Extended Repayment Plan: If your loan amount is higher, or you don’t feel your budget will accommodate a higher repayment amount, you might want to look at extending the term of your repayment plan. Your payments can be fixed or graduated, but here the repayment term will be extended to 25 years. In most cases, ​you must have more than $30,000 in student loan debt to qualify for this plan. Although your monthly payments might be lower, the total amount you repay will again be higher because you will be making payments for a longer period of time. Revised Pay As You Earn Repayment Plan (REPAYE): This does not apply to Consolidation Loans. In this plan, your monthly payments will be limited to 10 percent of your discretionary income. This amount is recalculated each year, based on your current income and family size. Any outstanding loan balance is forgiven if your loan has not been repaid in full after 20 or 25 years. Keep in mind that you might have to pay income taxes on any loan amounts that are forgiven, but this might be a good option for those considering Public Service Loan Forgiveness (PSLF). It keeps the payments lower while you work at what might be a lower-paying job in the public interest. Income-Based Repayment Plan (IBR): This is similar to the REPAYE plan, except that it does include Consolidation Loans. If you are married, your spouse's income or loan debt will be considered only if you file a joint tax return. Income-Contingent Repayment Plan (ICR): This does not apply to Consolidation Loans. In this plan, your monthly payment is the lesser amount of 20 percent of discretionary income or the amount you would pay on a repayment plan with a fixed payment over 12 years, adjusted according to your income. Income-Sensitive Repayment Plan: Your monthly payment is based on annual income, but the formula used to determine the payment amount can vary amount lenders. Repayment term is up to 15 years. Repayment plans can be changed at any time. It is best to talk to your student loan servicer if you have questions. 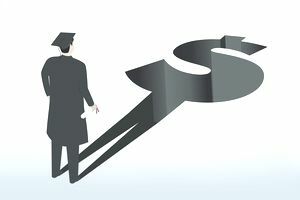 Lessons learned by college grads can also be great student loan primers for students just about to head off to college. Make smarter decisions about your financial aid package now, and you might not have so many money problems later.